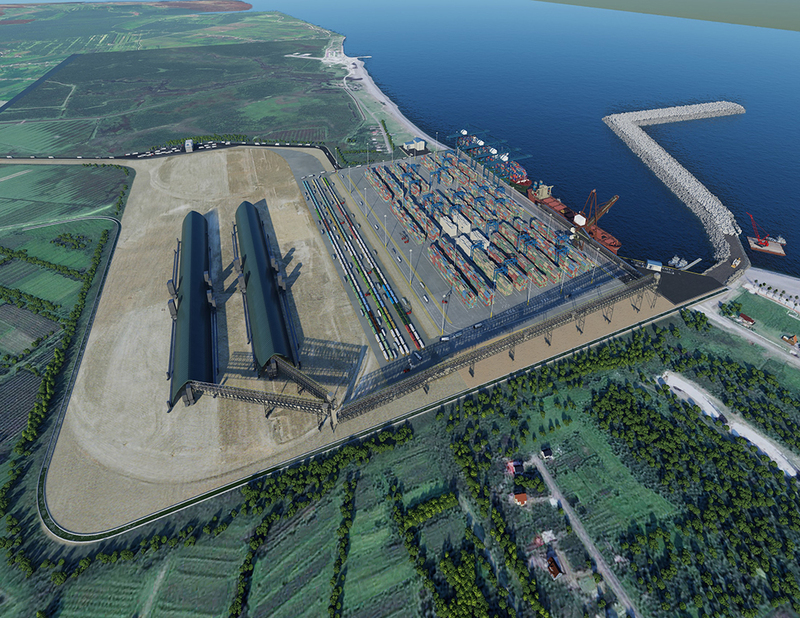 Anaklia, a major seaport project on Georgia’s Black Sea coast, promises to turn the country into a stopover for trade between China and Europe. But an escalating battle between the Georgian government and private investors has plunged the landmark project into uncertainty. Two and a half years ago, construction on the project – the first deep-water port on the eastern shore of the Black Sea – was launched with a ground-breaking ceremony. Overcast skies may have frowned on the proceedings, but the air was festive. Singers, priests and honorary guests celebrated the transformation of the little town of Anaklia and its swampy environs into an international transit hub. “This port will bolster Georgia’s position on the Silk Road,” declared then Prime Minister Giorgi Kvirikashvili, waves scalloping behind him. The port’s projected depth of 16 meters “will enable us to receive ships of any size and keep pace with the growing dynamic of freight transit,” he said. Fast-forward to 2019. Kvirikashvili is out of office and government officials are now increasingly questioning the project’s viability. The Anaklia consortium is busy parrying government accusations that it is failing to complete construction and attract investment on time. The consortium’s founder, Khazaradze, is under investigation for fraud. And consortium officials are warning darkly of conspiracies, possibly involving Russia or China. All this has left observers guessing what has gone wrong. The Anaklia imbroglio could be about anything from financial disagreements; competitors’ machinations; Khazaradze’s falling-out with the nation’s richest and most powerful man; or all of the above. But that is far short of the $620 million that Anaklia needs to complete the first phase of development and to host its first ship. Akhvlediani claimed the consortium has attracted $400 million in pledged loans from four international financial development institutions: the European Bank for Reconstruction and Development, the Overseas Private Investment Corporation, the Asian Development Bank, and the Asian Infrastructure Investment Bank. But before signing off, these institutions want the Georgian government to underwrite their loans. In other words, if Anaklia fails to deliver, the Georgia government would be on the hook for hundreds of millions of dollars. This is the gist of the problem, at least on the surface. Government officials insist that the banks’ requests were not part of the original plan for Anaklia and agreeing to them could saddle Georgia with a massive financial liability. “This was supposed to be a risk that the investor, the consortium, had to deal with,” Minister for Infrastructure and Regional Development Maia Tskitishvili said during a March 21 parliamentary hearing. The consortium insists the debate on who secures the loans is a red herring in a deliberate campaign to crush the port project or at least expel the consortium. The new Anaklia port threatens the dominance of Russia’s Novorossiysk, the nearest deep-water port, by attracting to Georgia a share of the West-bound Asian cargo that now travels via Russia. In comments to Eurasianet, consortium representatives speculated that Russia could be trying to stop Anaklia; or that China could be trying to take over and is, behind the scenes, putting pressure on Tbilisi to oust the Georgian-American developers. The consortium also suspects it is dealing with a personal vendetta by Bidzina Ivanishvili, the billionaire former prime minister, against Khazaradze. Suspicions of skullduggery around Anaklia stem from the particular series of events leading to the long-simmering investor-government dispute bursting into the open. Before officials began questioning Anaklia’s bankability, state financial regulators and then the prosecutor’s office began investigating Khazaradze, the Anaklia consortium’s founder, for financial fraud. The probe was focused on Khazaradze’s main business, TBC Bank, one of the two largest banks in Georgia. Last year, regulators fined Khazaradze for a 10-year-old bank transaction and then forced him to step down as the longtime chairman of bank’s board. Khazaradze is disputing these decisions in court. Then in January, the state prosecutor’s office announced that it was investigating the same transaction as an act of money-laundering. This announcement triggered an outburst from Khazaradze, who had previously kept his tussle with the authorities close to his vest. The banker dismissed the accusations and said that officials deliberately went public with the investigations against him to damage his reputation and hamstring his ability to raise money for Anaklia. TBC Holding, an affiliate of TBC Bank, holds a 40 percent stake in the Anaklia Development Consortium and has so far invested the largest chunk of cash – $40 million – into the port. He implied that the ruling Georgian Dream party had set state power against him for his refusal to show loyalty to the political establishment and Ivanishvili. During a rambunctious March 4 testimony before parliament, the banker scandalously claimed that he had been blackmailed by the government to provide support for last year’s campaign of President Salome Zourabichvili, whom Ivanishvili hand-picked for the job. Dismissing these allegations, government officials insist that the Anaklia negotiations and TBC investigations are two separate matters, but the consortium sees it differently. “I’m deeply convinced that Anaklia is the main reason this whole thing is happening,” Akhvlediani said at the press conference. “You fumbled Anaklia and now you are trying to switch the blame to the investor,” said Roman Gotsiridze of the opposition United National Movement party, addressing the government during a parliamentary debate on the issue.